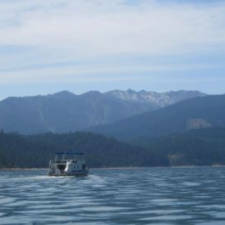 Trinity Lake Resorts and Marinas are located along the western shores of Trinity Lake in northern California Weaverville, California offers lakeside cabin rentals overlooking the Trinity Alps. They provide houseboats, powerboats, and fishing boats for visitors to rent. Its full-service marina comes complete with a restaurant and lounge in the main lodge building, a retail store, dry storage facilities, boat slip rentals, and a boat repair shop.